Rare view of the of Seat of the Civil War around Washington D.C. and the Chesapeake Bay. Seat of War. Bird's Eye View of Virginia, Maryland, Delaware and the District of Columbia. 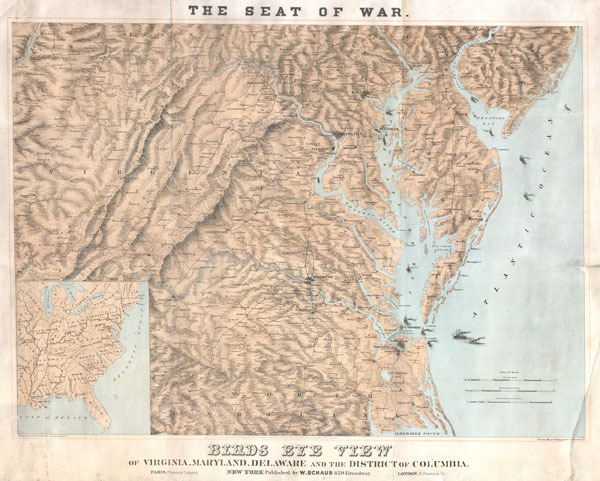 This is a highly unusual and uncommon map or bird's eye view of the seat of the American Civil War in Virginia, Delaware, Maryland, North Carolina, and the District of Columbia. Issued in New York, Paris, and France to address the national and international fascination with the ongoing events of the American Civil War. Shows the contested territories around Richmond and Washington D.C. where most of the bloodiest Civil War battles were fought. Offers astounding detail throughout showing towns, cities, river ways, and extensive topographical detail. Numerous steam powered ships are shown plying the waters of the Chesapeake Bay, the Delaware Bay, the Atlantic Ocean, and this region's numerous navigable rivers. Drawn and copyrighted by W. Schaus of 629 Broadway, New York. Published in three stone lithograph format in 1861 by the New York firm of Sarony, Major & Knapp. William Schaus (fl. c. 1857 - 1870) was printmaker active in New York City in the middle part of the 19th century. Schaus began his career in Paris with the established "Goupil, Vibert & Company". Around 1857 he was sent to New York to establish an American branch of the French firm as well as to set up an International Art Union to compete with the powerful American Art Union. Schaus, with his considerable experience and support from abroad, was able to lure several important artists away from the American Art Union. This helped him to develop an impressive portfolio of artists and prints. In the early 1860 Schaus split with Goupil Vilbert & Co. to establish his own offices at 629 Broadway, in New York City. There he continued to produce a varied corpus of works that included maps, views, art prints, and illustrations. Good. Minor creasing on original folds and in lower right quadrant. Closed repair from right side extending through margins and slightly into map. Margin repair, left side. Edge wear. On extremely thick stock. Library of Congress, Map Division, G3709.31.A35 1861 .S32 CW 17.35.